And what have I actually done today?? You could say I am a bit in denial about all the work I have to do before we leave for Thanksgiving. Me too. Packing. I am draggin my feet - big time. BUT, after this post... I'm on it. Like a skeeter on a baby arm. That was kinda gross, wasn't it. 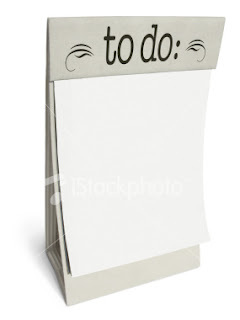 Bears a similar resemblance to my "to do" list. We leave Monday and I'm no where NEAR ready to go. Best of luck! I used to think that "Honey Do" lists were sprites of comedic fiction. "Like a skeeter on a baby arm"? LOL! My fave is "Like a rat on a cheetoh". Good luck with your to-do's.